This letter is almost 50 years old. 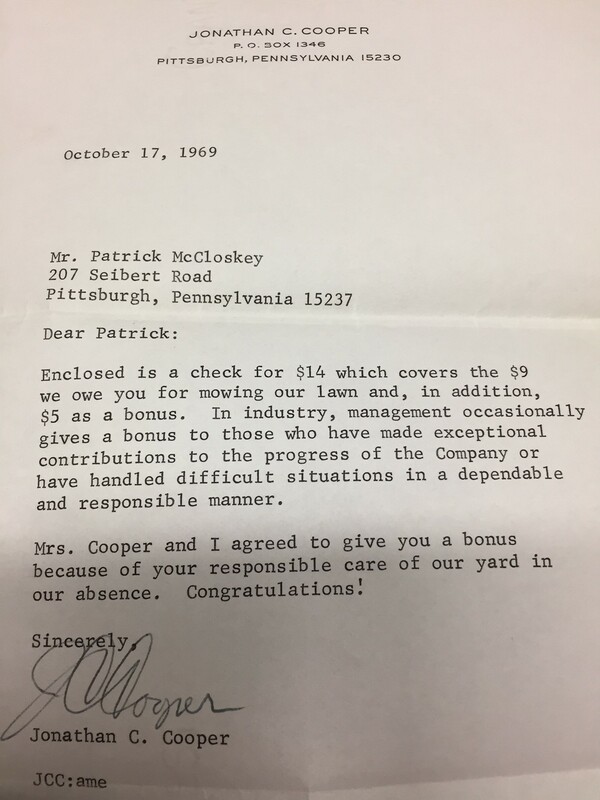 The compensation for mowing Mr. Cooper’s lawn was 9 dollars/week. The generous $5.00 bonus was more of a compliment than anything and I owe all of that to my father. Keeping this letter all these years was a testament to his influence on me. You see, my dad was an engineer and also a perfectionist. He insisted that if I was going to cut 11 lawns in the neighborhood, I needed to make sure that I trimmed after each mowing. No dipping the wheels in the gardens to avoid the trimming. The burned grass and dirt would be a dead giveaway and my dad would be none too pleased. He initially inspected our lawn and the neighbors lawns until he was satisfied that I was doing it the right way. The McCloskey way. Fast forward, when we moved from Siebert Road, there was a lot more maintenance at our new home. Not only was I instructed to rake the leaves away from the hedges, but I had to grub out the leaves in the trunks of the bushes. This was on my hands and knees, digging under the bushes. A less than noble task. When my dad planted his thousands of flowers, he manned an auger attached to his drill and again, I was on my hands and knees planting the flowers. The end result was beautiful but I learned quickly that manual labor was not a Spanish Diplomat. R.J. McCloskey got me involved in caddying and parking cars at his golf club and eventually some stints in the kitchen when they needed me. He eventually got me a job at St. Joe Paper in college summers, initially as an outside laborer- once again cutting grass and painting, but eventually a 3 shift union laborer. I learned a lot in the bowels of McKees Rocks, Pa. especially at the end of the night shift. 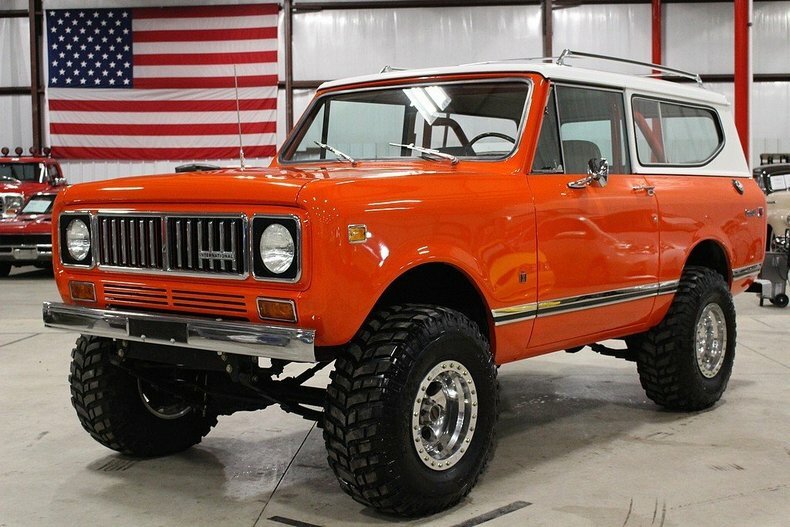 I had an orange International Scout once upon a time, and my dad thought I could go anywhere and do anything with that vehicle. While constructing his greenhouse he needed several pieces of 9 foot steel angle iron and he made a deal with his friend Clyde” the glide” Snyder to pick up some of these steel pieces at the National Steel Warehouse on the Northside of Pittsburgh. When I pulled in with all the flatbed trucks the guard laughed and said, ” What are you doing here man?” I told him I was here to pick up the order for the angle iron, he said, ” Well, if I loaded you, the crane would probably put the front of the load right through your windshield.” ” Come back with at least a pickup.” I did and he loaded me and as I went around a steep bend on Venture Street, I lost the load on the street with a loud clang. AAA eventually came to help me reload the steel with their hook truck and I made my way to Wexford, cursing my dad all the way. We had a good laugh about it later, but in typical fashion, my dad thought he had molded me into some kind of super human – which I was not. I turned out to be a good laborer, but nothing like he envisioned . My dad and I were very close. I miss him. I don’t cut grass anymore. I don’t mulch, weed, plant flowers or rake leaves. I live in a carriage home community now where all of this is done for you. My friend Porter tells everyone that I have moved into assisted living. He laughs hysterically but deep down envies the fact that my manual labor days are over and he is still cutting grass. I cut grass for 50 years, so I did my share. But getting back to …………..the letter. The important lesson that has stuck with me all of my life is to do things right. My dad insisted on that. Even in my job today, I take care of customers. I follow up, see that things are done correctly and that the customer is satisfied. My dad gave me that ethic and it is so important today. There was nothing half assed with R.J. I don’t miss cutting grass or raking leaves or grubbing. But I will always cherish the good lessons that my dad taught me. He grew up in the depression. Tough people who did things right. The Greatest Generation. Thanks for reading. 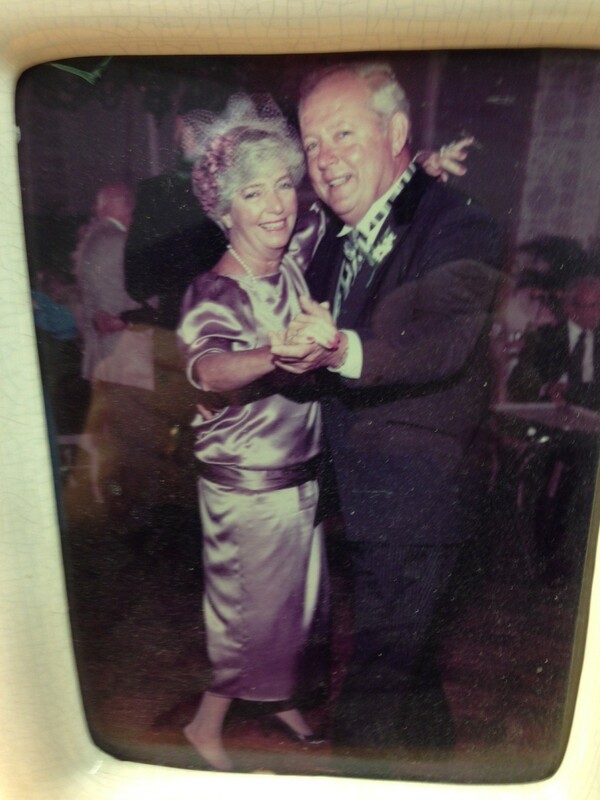 This entry was posted in Aging, American Culture, Culture, Education, gardening. I love the Orange International and a nice set of rims too! Not what I would have expected from the guy that runs the wheels off his not well aesthetically maintained Jeeps! Just writing letters takes a lot of self discipline and initiative that you do not see much today. Your and my parents most definitely were from the greatest generation. Thanks Edie. Hope you are having good summer.